When we learn in Tanya that Yemos Hamoshiach—the Days of Moshiach, the Messianic Era—as “the ultimate purpose and perfection…for which [this world] was created in the first place”, we recognize that we have an obligation to clarify for ourselves what exactly goes on in those days. 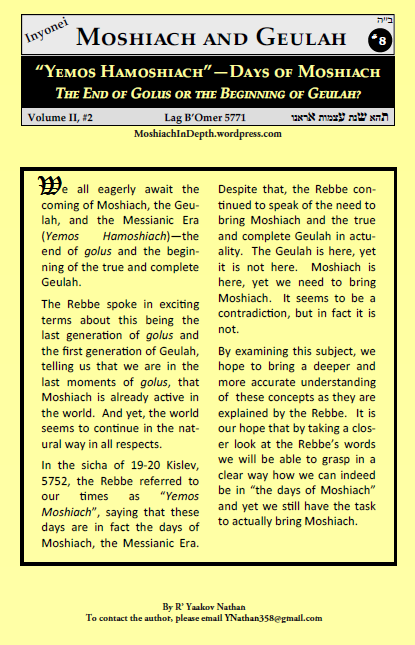 What is the relationship of Yemos Hamoshiach to the coming of Moshiach and the Geulah. The same thing with different names, or different matters entirely? As we examine this subject a little closer, we will probably be surprised to find that we hold some misconceptions about these terms. The Rebbe often emphasizes that there is only one halachic source which rules about Moshiach—the Rambam in his Mishnah Torah, the final section containing the Laws of Kings and Melech Hamoshiach. As the Rebbe points out, none of the commentators on the Rambam challenge any of the rulings there, which means that they are universally accepted and therefore they are halacha lema’aseh (laws with practical application). The Rebbe points out, however, that the Rambam himself writes in his Igeres Teimon that it is possible that there will be miracles and wonders at this time, and that the prophecies may indeed be fulfilled literally. Says the Rebbe “Igeres Teimon is true…it is a certainty that the Rambam holds that in the time of Moshiach Tzidkeinu there will be signs and indications—wonders.” It seems strange that the Rambam would contradict his own halachic ruling. The Rebbe resolves this seeming contradiction by explaining that in fact Yemos Hamoshiach are divided into two tekufos, two distinct periods: a) the beginning of Yemos Hamoshiach, when “there is no difference from this world besides servitude to the nations alone”; and b) a period following this when the natural conduct of the world will be nullified and instead the conduct of the world will be in a way of wonders. A simple question arises: are the days of Moshiach the period that begins after Moshiach comes, or is the period that leads up to the coming of Moshiach? The question is made stronger by the fact that the Rebbe said that “we are found now” in Yemos Hamoshiach, yet in subsequent sichos the Rebbe speaks of actions which “bring closer the coming of Moshiach”. When speaking about the time that “Moshiach comes”, one can be making a reference to two very distinct instances. For we must recall that Moshiach must, according to the Rambam, accomplish a series of tasks, beginning with compelling all of Israel to live according to Torah, fighting the wars of Hashem, building the Beis Hamikdash, and gathering the exiles. It is self-understood that the first thing is that Moshiach must come (“a King arises from the House of Dovid”) and only then we can begin to speak about Yemos Hamoshiach. Then, only after the Moshiach has accomplished all of these things, do we actually experience the revelations of Moshiach, which is in fact referred to as “the coming of Moshiach”. This means that the revelations of Moshiach down below will be after the ingathering of the exiles…that after they will be gathered by him then he can be a king over them…and then will be the revelations of Moshiach. In other words, there is a “coming of Moshiach” at the beginning of Yemos Hamoshiach and there is a “coming of Moshiach” at the culmination of Yemos Hamoshiach. This enables us to understand how the Rebbe could refer to “in our days—Yemos Hamoshiach—in which we find ourselves now” and one month later devote the better part of an entire sicha11 to the concept of “bringing Yemos Hamoshiach”. Having drawn this distinction, we will now proceed to examine Yemos Hamoshiach in more detail. Dvar Malchus in English (Talks of the Lubavitcher Rebbe) These talks, given in the years 5751-5752 (1991-92) contain eye-opening revelations about our era–the era of Moshiach.